blocks from the famous Ocean City Beach. Overlooking a baseball field in the wetlands. Just a short walk to playground, tennis courts, restaurants, drug store, supermarket and convenience store. Only a short drive to the boardwalk and downtown activities. Enjoy your vacation in America's Greatest Family Resort. This comfortable weekly rental unit has a living room, dining room, fully equipped kitchen, 2 bedrooms, 1 full baths, shared washer and gas dryer. Sleeping 6: 1 queen beds, 3 twin beds, and a queen sleeper sofa. Washer/Gas dryer. Bran new kitchen with dishwasher, microwave, range/oven, coffee maker, all miscellaneous appliances, 3 window air conditioning units. Clean, reasonably priced shore spot, especially since it was just my sons, their buddies and me (Mom was away). Pretty much everything we needed to enjoy our week in OCNJ. Only issue was a missing toilet plunger and things got dicey one night! We got by just fine though! Great location, clean and perfect size for my family! We had a wonderful week. The house is in the perfect location. Close enough to walk to the beach, great park for little ones, and away from the noise of the board walk but very short drive when you want to go and enjoy it. We visited this property for our first family-friendly vacation (children ages 3 and 1) The house was the perfect size for a small family and very safe for young children (no steps). Location was perfect! 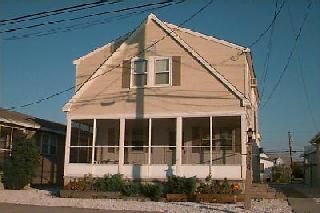 Walking distance to beach, park, ice cream, hoagies, and pancakes! Very clean and modestly decorated (we weren't scared to touch things), anything fancier would have been stressful with the little ones. My mother in law joined in on the fun and felt exactly the same! Quick drive to Atlantic City for a fun date night! Would recommend this property to family and friends and would stay here in the future! Happy Vacationing! Ocean City offers additional shops and restaurants for everybody. casinos close by in Atlantic City.